Most of us in the prepping or survivalism lifestyle have had to deal with rolling eyes, snickers, and even whispers behind our backs. Then there are the ones who outright laugh at you and tell you that you’re crazy. There is no right answer for those questions because every person and situation is different. Unless you live in an area where natural disasters are ‘normal,’ such as Tornado Alley or the Gulf Coast, most people just do not see the need. They may expect the local, state, or federal government to swoop in with supplies and save them. Those who have gone through Katrina, Sandy, or other disasters know better. Getting people to see that the stuff that happens on TV can happen to them, too, can be next to impossible if they haven’t had to endure something like that. Most people have never had to truly take care of themselves, relying on nothing but their own skills and the resources they have on hand. My high school best friend told me they would just come to my house if something happened. I told her that while I loved her, I could not and would not prep for her and her two children. She was taken aback by it, and perhaps even a little offended at my blunt answer. Instead, I came up with a solution that would serve many purposes and smooth ruffled feathers: Make them an emergency kit and give it as a gift. 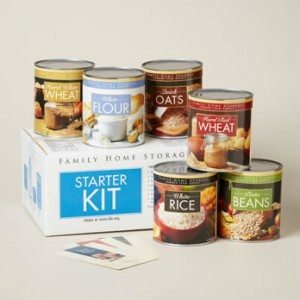 Last Christmas, I bought and gave out these food starter kits that are sold by the Latter Day Saints (LDS) online store. They are very reasonably priced, shipping is FREE in the USA (even Alaska and Hawaii!!) and they have 6 – #10 cans of basic food with a shelf life of 10+ years. For your loved ones who are on the road often, a 72 hour vehicle kit would be easy enough to put together without breaking the bank. Many items can be purchased by going to the local Dollar Store. This, of course, begs the question, “What do I put in it?” Each kit can be different based on who you are giving it to or you can make several kits and put the same things in each one. Whichever way you decide, each kit should have enough supplies to cover things like shelter, water purification, food, and warmth for a 3 day period. I recommend a basic first aid kit as well, if you can afford it. Tossing in a deck of cards or pack of dice is a nice touch because if you are in a spot where you have to actually use the items in the bag to survive, morale will not be very high. Even a game of “Go Fish” can help pass the time and give a sense of normalcy. Basic Kit: To keep in a home, dorm, or apartment so you can last until help arrives, especially the special needs and elderly. Car Kit: Especially for those who travel a lot, do a lot of driving at night, or are new drivers. Pet Kit: Pets are family too. Special Medical or Dietary Needs. Graduation: Most recent grads need everything. You might as well give them a leg up on emergency preparedness. Kids Kit: This could be for the house, travel (visiting grandparents, for example), school, a sports bag, or anywhere else they spend time. Elderly Kit: In addition to all the other concerns, the elderly get home-bound more easily from weather or health issues. First Aid: Most people have bandages and some other basics. They probably do not have elastic bandages (dry-rotted or stretched ones don’t count), finger splints, a SAM splint, QuickClot (if you really need it, no ambulance can get there fast enough), 2nd Skin burn pads, etc. Yes, they are emergency preparedness / disaster supplies, but it’s amazing how useful they can be in everyday life, too. Birthday / Special Occasion: Most adults are hard to buy for, and “preparedness” covers a lot. A new cast iron skillet for a chef, new quality hand (not power) tools, a solar charger for the gadget-lover, camping items for a Scout…. With a little imagination, you can find something that isn’t, well, kind of like getting an appliance. Evacuation Kit (Bug Out Bag): What you need to evacuate to somewhere safe. The possibilities are endless but just remember: There is no ‘right’ or ‘wrong’ way, each person is different. So long as you cover the basic needs for food, water, shelter, and warmth, the kit can save a life. At this point, you may be asking yourself why go to such lengths for people who (even though you care for them) do not support your efforts and think you are a little ‘touched’ in the head? Before you go thinking I am some generous and good person, there are some purely selfish reasons that I decided to go down this road. Making sure that if they show up, it won’t be empty handed. Making things easier for myself and them because they don’t have to think about it. You store the kit or box of food and forget about it. I can assure you that they will remember it when they get hungry, cold, etc. Setting myself up to be the hero. Should they ever actually need the items I gave – they will remember it and be thankful for it. Getting what I want. I want them to be prepared. I want them to be able to survive and thrive after the disaster. I cannot force them to start learning new skills but I can make sure they have beans, rice, bandages, and a way to purify water. They don’t have to do anything; just store the items. I am sure there are other ways to help take care of your loved ones who refuse to put back anything ‘just in case’ or listen to anything that may even remotely be considered ‘prepping.’ These are some of the ways I try to help those who do not see the need to prep for the future in terms of food, water, and the skills needed to survive without electricity and grocery stores. If you didn’t win the HERC, here’s a great discount for you! Your vacuum-packing machine can pack a whole lot more than just food! I live in the Pacific Northwest, and I find that a lot of people are not prepared for an emergency let alone a disaster of any type. We have several volcanos, military submarine bases and are at ground zero in the event of a nuclear incident or accident. Our schools however are on top of it. Every year we are required to provide a 72 hour emergency kit for each of our children. When my girls started kindergarten, we started prepping at home as well. Now 13 years later, we are educated, but deficient in supplies as we try to fill the emergency cupboard on less than a shoestring budget. I really enjoyed this post, and am wondering if you have any tips on long term food storage ideas for home dried, canned foods. I understand that canning should be eaten within a year, so what should we do to save food for 10 years? I can understand a shoestring budget! One of the things I personally did was to buy a pack of mylar bags and O2 absorbers for things I wanted to last longer than a year. For example, I bought a 50 pound bag of pinto beans on sale at Walmart. I filled up the mylar bag, dropped in the absorbers and sealed it with a hair straightener! It has an adjustable temperature setting and was around $25 versus $100+ for a “mylar bag sealer.” Yes, it worked. Those same beans have been sitting in long term storage for about a year and a half and are just as strongly sealed as they were when I first put them in. I have also done that with barley, cornmeal, a dry bean mix, and wheat berries. Doing it all a little at a time is a huge plus. Be CAREFUL when buying the mylar bags though. You want to have a thicker bag (I use 5 or 7 millimeter) in the one gallon size. I bought a 5 gallon size only one time. They are so large that the manner in which the company folds them causes pinholes on the creases and makes them absolutely worthless. The one gallons are simply folded over once and can hold a large amount of food. Good luck! I am a secret prepper and everyone in my life will sit with their hands folded in their laps and wait for the government to come save them. I can’t take care of all of them. Without giving my game plans away, it is hard to encourage people to make their own plans. We all saw the result of Hurricane Katrina and most people learned nothing. What a great wedding gift, a hurricane kit. I can spend as much or as little as I can afford. Our backgrounds give cause for action, We have encouraged others and have gotten eyes rolled and impatient sighs, oh well. Presents sounds like good places to start. I might suggest that combining items in any ‘bag’ you create: by this I mean that including rubber gloves and masks for any type of pandemic situation is a good idea. With the recent ebola scare, I’m buying a body suit as well…. I know, probably won’t happen, but well, we ARE talking about things that hopefully won’t ever happen, but eventually WILL. Get the basics first, but then, as you progress into your prepping plans and are able, adding things like the suit and maybe even better masks, you will REALLY be prepared for anything that comes along! Secret preppers are the smart ones! If everyone knows you are prepping, they WILL come to you when things go wrong, if they have been lazy about being smart and prepping items or emergencies. 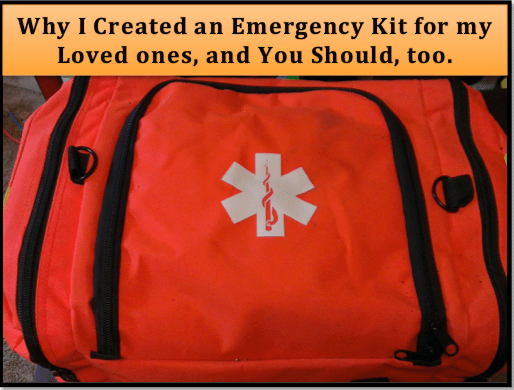 I LOVE this idea for those who don’t see the realities of being prepared for emergencies. Giving this as a gift, they just might wake up! I started with my children last Christmas, They all received Emergency Essential’s 6gallon bucket toilet with supplies as well a printed notebook about handling waste. (The pictures were great with sons seating on their pots) Than this year I started the 12 Months before Christmas packages. 1st one was a Home Depot bucket with Gama lid on it with notebook on all natural disasters. And so the months have proceed with usually a theme and printed materials with information and new skills. My granddaughter had an alert for tornado, she grabbed her buckets and kids and headed to the basement. It has been fun and a growing time. It has helped to get my mother on board. We had a tragedy recently where a hiker left his group to travel back down the hill to his car after breaking his glasses. He was only going a mile or so through fairly densely forested terrain. Long story short he never made it and his badly decomposed body was found miles away 6 weeks later. Because of this incident i have made my bush-loving daughters a small survival kit each that consists off a; button compass (to walk on a heading), survival blanket, lightweight poncho, lighter, flint rod, fire starter and tinder, basic 1st aid kit, knife, basic fishing kit, signal mirror, flouro tape (to mark their path), a few stock cubes for soup ect. Just as important though they know what to do if they get “bushed” and how to cope. Its not a case of not letting them go, its a case of preparing them properly to go. These little kits are about 2″x3 1\2″ so they fit in a pocket and weigh nothing. Very smart. Some of the most important survival tools are quite small and easy to carry everywhere. They don’t need to know why you are giving them those things. Go with “I couldn’t figure out what to give you and everyone needs a First Aid kit.” Or blame it on an alarmist news article / neighbor / whatever who got you riled up just as you went shopping, then you were too embarassed / it was too late / whatever and you couldn’t exchange it. You can look up pen and paper games on the internet. Make game boards, put them in sheet protectors (I like the small 5.5 by 8.5 I think) add Vis a’ Vis markers which can be wiped off with a damp cloth. Instant reusable game board. This gives a nice variety of distraction. I’ve mad a book of games including chess/checkers that I made the pieces for since I couldn’t find any on the market. Just as an FYI, the “LDS Starter Kit” has been discontinued sometime in the last few months (I must have gotten one just before they stopped offering them). They told me that because they had a wider selection to choose from now, and also because the starter kit was seen an introduction to the pre-pack program, the starter kit was no longer considered necessary. That’s a shame. If you are looking for a smaller combination of items together, you can not get that but must buy larger amounts of individual items instead (by case). Could always split a purchase with someone though.